The SR876 includes a Mahogany body with a Flamed Maple top, 2 Bartolini pickups, Ibanez Custom 3-Band EQ, and a custom Accucast B506 Bridge. The new SR876 series are some of the most visually striking basses within the SR standard line. 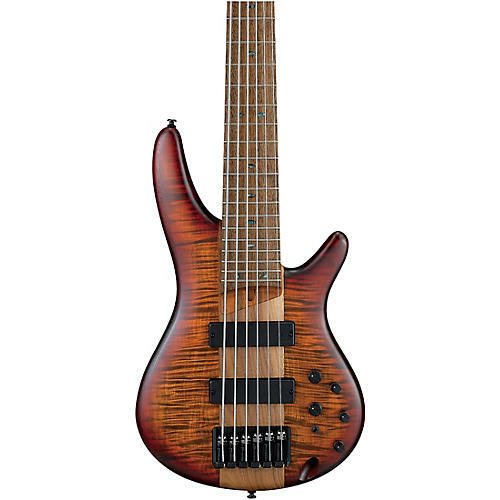 The bass features a Flamed Maple top and Mahogany body, as well as the new “Accu-cast B506”. The Maple top produces a clear tonal attack while the Mahogany body delivers a warm and fat low end. The principal feature of the new bridge is the saddles can be adjusted for various string spacing. The bridge was developed in an effort to meet the needs of various players who enjoy different string spacing. The saddles can be easily adjusted to widen or tighten the string spacing by +/-1.5mm. It also offers precise intonation and delivers excellent string-to-body vibration. The thin, sturdy, and stable Jatoba/Walnut neck offers superior playability when combined with the extended neck joint, making the upper frets easily accessible. The truss rod adjustment at the neck pocket allows you to easily fine-tune the neck without loosening the strings. The Ibanez Custom 3-band electronics and 3-way mid-frequency switch allow for precise tonal control with selectable mid-range EQ points at 250 Hz, 450 Hz, and 700 Hz. The Bartolini BH2 dual-coil pickups, with their lower resonant frequency, provide a balanced warm response, tighter bottom end, and a fuller midrange. The smooth, fast neck, lightweight body, and perfectly matched electronics, are engineered to satisfy the particular needs of bassists, as well as inspire their creativity. The innovative Ibanez SR876 will inspire you to your creative peak. Order today.